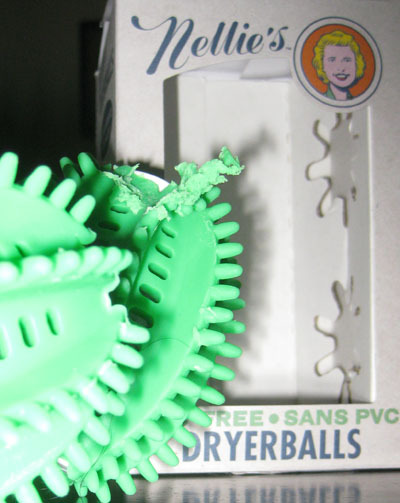 I miss using dryer balls! If you check your dryer’s lint trap, you might notice that dryer balls cause your clothing/linens to produce more lint, to break down just a little bit more than they do without the balls. Fabrics won’t last as long, and I spend too much for that to happen to mine. As a conselation tip, to avoid static and to get a nice scent in my dryer loads, I set aside a cotton sheet of fabric, which I dampen with water, put about a half tablespoon of eco-friendly fabric softener onto, and then bunch the sheet up and twist it to get the softener worked in. That’s my dryer sheet; I have four. This way, I don’t have to spend money on commercial materials that eventually burn in the dryer’s mechanism, and don’t contribute positively to the environment. Hi Claudia. Thanks for commenting. I’m currently trying out some wool dryer balls, which I’ll review here soon. So far I like them. 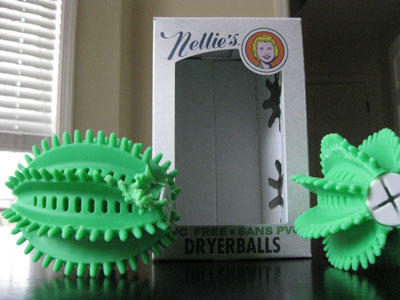 They don’t make as much noise as the Nellie’s ball, and they’re very soft. I haven’t noticed more lint in the trap. I do get a little nervous about the balls potentially causing more wear on clothes, but I haven’t noticed any evidence of this yet. I like your homemade dryer sheet idea. I guess I would have assumed that the liquid fabric softener would transfer onto clothes in the dryer, but I guess it works if you work it into the fabric sheet. I’ve actually never tried liquid fabric softener before. Do you have a favorite brand? HEY! Yeah, I use ECOVER Sunny Day. It claims to make ironing easier, soften and freshen laundry, and be ideal for babies. I can’t prove any of these things. But the ingredients are plant based, it contains no phosphates or brighteners, is biodegradable & safe for septic tanks, minimal impact on aquatic life – http://www.ecover.com – they’re Belgians. If they make such good chocolate, their fabric softener can’t be bad! One side note regarding fabric sheets: the airborne fiber eventually toasts and you get deposits of crispies on your clothes. I have had this happen, and I can’t imagine it’s good on any front. That’s why I like the sqares of cotton sheeting/rag.